My weekly trip to the grocery store hardly ranks as one of my favorite activities, so I usually treat myself to an impulse purchase (or two) as a reward for enduring the chore. This Sunday, beyond stocking up on bread, cereal and Edy’s Slow-Churned ice cream, I bought me some black water. More precisely, I picked up six bottles of blk.® water, falling prey to its dark, ominous plastic bottle. If this was just another brand of overpriced water in a trendy bottle, I probably could’ve overcome the temptation. But this liquid promised so much more than some garden-variety Dasani or Fiji. I have absolutely no idea what any of that jargon means (or its purported health and wellness benefits), yet I was still bamboozled like the gullible consumer I so often am. Despite having a marketing background and a cynical mind that should know better, I was wooed by the hype – like some poor schmoe at the county fair who gets suckered into playing a seemingly simple game that is virtually impossible to win. Did I really believe this new, revolutionary water could cure all (or anything) that ailed me – besides thirst? Hey, a sucker can dream, can’t he? When I got home and unloaded the bottles, I noticed the label touted the product’s ZERO CARBS, ZERO CALORIES, ZERO SUGAR and ZERO CAFFEINE. …Until I cracked open a bottle and realized it was chock full of BLACK DYE. That’s right, I had wrongly assumed that the bottle was black and the liquid was clear. Turns out the opposite was the case. The bottle was crystal clear, and the water was an inky licorice color, with a faint purplish hue. 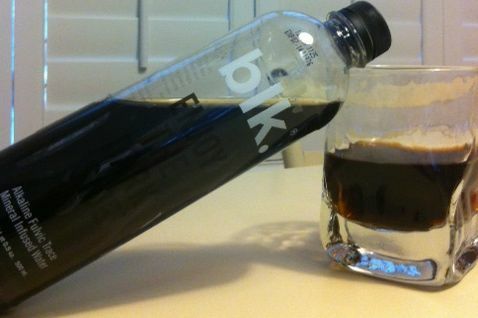 As it turns out, black water was exactly what I had bought. Thank goodness I didn’t opt for the boring clear liquid that flows freely from my kitchen tap when I could overpay for an inky substance with alkaline fulvic characteristics I didn’t even understand. Behold, the power of marketing (combined with human gullibility). The product is SO new, SO revolutionary that the official blk. websitehasn’t yet launched (about two more weeks until that puppy's unveiled). But the current holding page did invite me to purchase a $19.99 T-shirt so I could help them spread the word. Somehow, I resisted the urge.